The first time we met, I noticed a fiery intensity behind his eyes. He was absorbing and questioning everything I was presenting. I could see he had the desire and energy to learn and become one of the best in the work. Any teacher will tell you that occasionally a student stands out in their mind as having the potential to become one of the greats in the profession. Unfortunately, most of these people never seem to have the energy or willingness to take the professional and financial risks to make this become their reality. Not Cal Banyan. For example, when I was presenting marketing techniques in class, I said some of the techniques would be very expensive to implement and most people would be wary of making such a large investment when they were first beginning in the profession. Not Cal. He invested in himself and his continued education. Because of this, he has become one of the most successful, respected and exciting professionals in the work today. I am very proud of my student and my friend. This book is very different than other books on hypnotism. 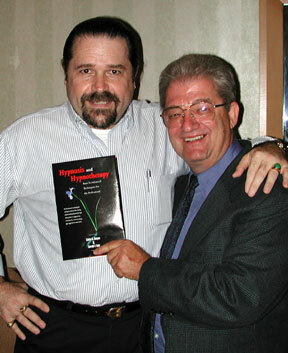 There is nothing in it that is a rewrite of the usual hypnosis book. It is not esoteric, convoluted or boring. The information is presented in a step by step method that leads to easy understanding and learning by the reader. This book does not tell you what you can’t do. It stimulates your desire to become the very best you can be. Most of the information in the book is taken, and then improved upon by Cal, directly from my classes. Cal Banyan has honored me greatly. This book is the first and only book in my long career ever presented to me that I can totally and enthusiastically endorse not only the material but also the ethics and professionalism of the author. Cal Banyan has given you the most easily learned, step by step, duplicable methods to increase your success rate not only with those issues usually dealt with by direct suggestion but also those issues requiring passive and aggressive regression techniques. Whether you are new to the profession or have been part of it for many years, this book will give you a wealth of practical, usable information which you can immediately incorporate into your practice. I have no doubt, as time goes by, this writing will become one of the classics of the profession. The methods taught are both new and timeless. I believe they will be used by future successful hypnotists for generations to come. In my opinion, this book should be a primary part of every hypnotist’s resource library. I know it will be a continuing support to you throughout your career.